The view south across the lake toward the mountains known as the Bubbles. Here are a few shots from a hike we took last weekend at Eagle Lake, part of Acadia National Park. Perhaps I've been spending too much time walking past those hallucinogenic mushrooms (see previous post), but I kept seeing animal forms in the forest. Is this a downed tree or steer lying in a clearing? Though Acadia isn't known for its cattle, we'll say both. O.K., so use your imagination again. I see a woolly mammoth facing us, rearing its tusked head and trunk. Think I'm crazy? Compare it to the image that follows. So what do you think? 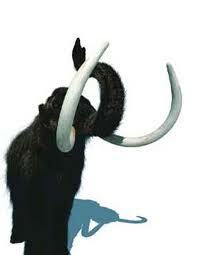 A mammoth exaggeration?